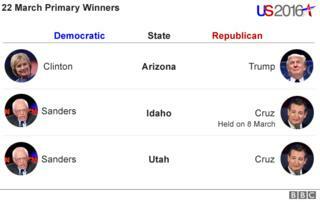 Three more US states held primary elections on 22 March, including a Republican winner-takes-all delegates contest in Arizona, and democratic caucuses in Idaho. Keeping his campaign in the race, Democrat Bernie Sanders decisively won caucuses in two smaller states, Idaho and Utah. Ted Cruz continued his efforts to force Mr Trump to a contested convention with a win in Utah. Click or tap on the links below for full results, provided by the Associated Press. Winning delegates, the people who endorse a candidate at the party conventions in July, is key to securing the nomination. The Democratic totals include the delegates won per state, as well as so-called "unpledged" or "super delegates". Hillary Clinton has a huge lead among the party leaders and elected officials who each get a vote at the convention. AP conducts surveys of these super delegates, and adds them to a candidate's totals if they indicate their support. But super delegates can - and do - change their minds during the course of the campaign, so the figures may shift as the race unfolds. The delegate tracker is updated automatically. There may be a short delay between the delegates being assigned and the totals changing.